MOTHER 1 Figure Straps Coming in August! Takara Tomy has been releasing all sorts of MOTHER 2-related merchandise over the past year or two, including MOTHER 2 figurines and MOTHER 2 straps. 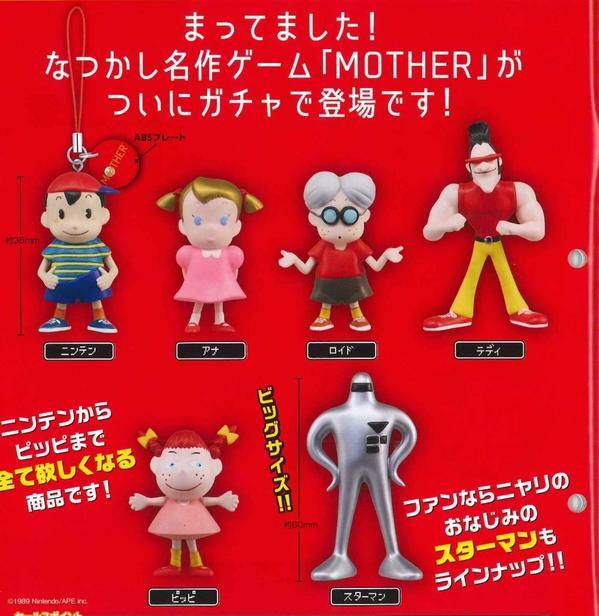 Well, the time has come at last for MOTHER 1 to get some capsule toy love – starting this August in Japan, you’ll be able to get MOTHER 1 figure straps too! Since this news is still very early – I think the info releases yesterday – there aren’t any import shops that offer to sell them to fans overseas, but as I find out more I’ll share info here on EarthBound Central. Here’s also hoping that if they’re going to do MOTHER 2 and MOTHER 1 stuff, that they’ll do MOTHER 3 stuff too someday! 15 Comments to MOTHER 1 Figure Straps Coming in August! They look good, except for Pippi which is oddly creepy. Hopefully Nintendo will release MOTHER 1 on Wii U Virtual Console in America. What does the kana under Ninten read? If I remember correctly, we weren’t sure if Ninten is his actuall name. The name has been used in guides and also in Smash bros. MATO!!!! That lady who made the massive Ninten plush is back with a smaller Ness, you must post about it!!! you can already pre-order them from ebay. They’re scheduled to be released in the latter half of August, so nothing new to report yet.